The Mundie Putter Golf League is a competitive amateur league that has run continuously in Winnipeg since 1957. The League consists of an ‘A’ Division and a ‘B’ Division. The ‘A’ Division is the premier division and teams move up or down between divisions based on performance. The top 3 teams in ‘B’ division move up to the ‘A’ Division and the bottom 3 teams in ‘A’ Division move down to ‘B’ Division on an annual basis. The competition is played using the four ball format at match play. Each team is represented by 8 players, and matches are played on Mondays. Upon conclusion of the regular schedule, playoffs are held to determine a champion. Breezy Bend, Glendale, Bel Acres, Selkirk, Larters, Pineridge, Elmhurst, St. Boniface, Niakwa, Transcona, Rossmere, Wildewood, Southwood, Assiniboine, St. Charles. The 2015 League Championship was won by Breezy Bend. Over the 59 year history of the League the competition has been dominated by Elmhurst with 23 wins, followed by Breezy Bend and Niakwa with 9, St. Charles with 5, Southwood and Pine Ridge with 4, the MGA Juniors with 3, and St,Boniface and Rossmere with 1 win each. Scores for the Mundie Putter League are posted on the Mundie Putter website. What are single length clubs? As the name implies, single length clubs are a set of golf clubs where all the irons (but not the hybrids and woods) are the same length. I first started dabbling with the notion of a set of irons that were all the same length long before the Internet was prominent. Back then (late 70’s early 80’s) there were very few, if any, good sources of information on the topic so basically I reverted to the tried and true method called experimentation. What caused me to start down that road was a realization that I think all golfers come to at some point in time, that being: there are one or two irons in the set that you hit much better than the other irons in the set. For most golfers, that one favorite club that feels better and results in better shots is the 7 or 8 iron and in some cases the 6 iron. I’ve heard many golfers say, “if I could just hit the rest of my clubs like I hit my seven iron, I’d be a pretty good player”. Back then I did not understand much about swing planes, and had only a rudimentary understanding of the prevailing principles of golf club construction. To address this issue I decided I needed to get some instructional material about how major manufacturers assembled golf clubs and the principles they employed so I purchased some books on golf club assembly. Before I knew it, I was assembling golf clubs at first for my own use and soon thereafter for friends and fellow golfers. Traditional golf club assembly principles dictate that clubs are progressively longer through the set. Wedges start around 35 to 35.5 inches in length and then each club is built 1/2 inch longer so by the time you get to a 3 iron it is around 39 inches long. To accommodate these changes in club length the lie angles change starting around 64 degrees for wedges and progressing to 59 degrees for a 3 iron. The head weights also change starting around 300 grams for a sand wedge and arriving by increments at 230 grams for a 3 iron. In theory the difference in head weight and shaft length from a wedge to a 3 iron should result in a set of clubs that all ‘feel’ the same. The shafts are ‘tipped’, which means shaft material is removed from the lower end of the shaft to make them progressively stiffer as the heads get heavier. 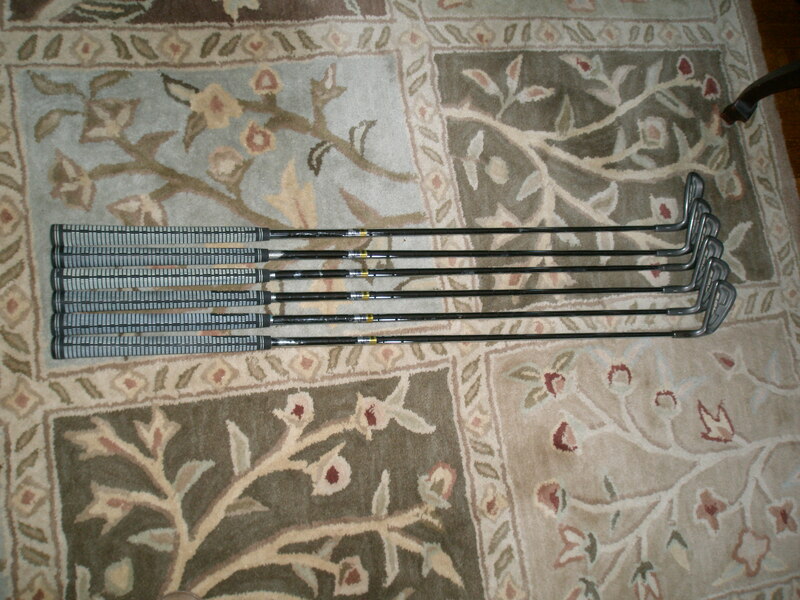 In 1986 the Tommy Armour Golf Company produced a set of clubs called EQL (equal length). 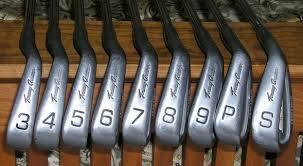 These clubs featured a head very similar to the Armour 845’s which were popular at the time. The difference was all the heads weighed around 260 grams and all the irons were the length of a 6 iron. Because the idea of single length irons was considered too radical a departure from the norm, Armour was not able to get any prominent professionals to play or endorse the clubs. As a result the idea was scrapped and production was halted. The EQL irons were inspired in large part by Moe Norman’s swing. Norman, who used a single plane swing, choked down on most of his irons to the point where he was in reality hitting what amounted to single length irons. I have a set of EQL’s and they are pictured below. Although I have played these clubs with some success I was never a fan of the offset Armour 845 heads. Being a fan of Bryson DeChambeau who uses not only single length clubs, custom-made for him by Edel Golf but also a single plane swing, I have decided I need to build myself a set of new single length irons. Although you can now purchase custom-made single length irons the cost is substantial. I have settled on Pinhawk heads. 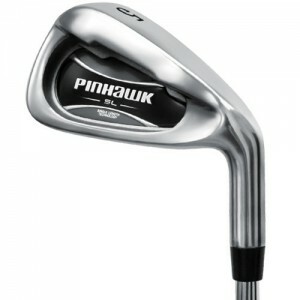 They are available from flop wedge through 4 iron (with an optional 4 hybrid) with a lie angle of 62.5 degrees and a head wight of 272 grams throughout the set. The head I have selected is pictured below. How far do you drive the ball? When someone asks you about your game the answer you give may well depend on who is asking, why the are asking and when they are asking. Many golfers have a tendency to either exaggerate of downplay their abilities depending on the circumstance. On the first tee trying to negotiate strokes, golfers tend to downplay their abilities. If asked at a social function how far you hit your driver and you realize it is highly unlikely that you will ever have to back up your statement you may say ‘oh, around 260- 280’. The thing is you may have once hit a drive 280, with a 30 mile an hour favoring wind on a dry course with fairways like a parking lot but is that anywhere close to your average. According to Trackman, at sea level, with no wind and under PGA Tour conditions using a Tour quality ball you need a swing speed of around 105 MPH to hit the ball in the 260-280 Range. And that presumes you are hitting on the center of the club face with the optimum launch angel and spin rate. 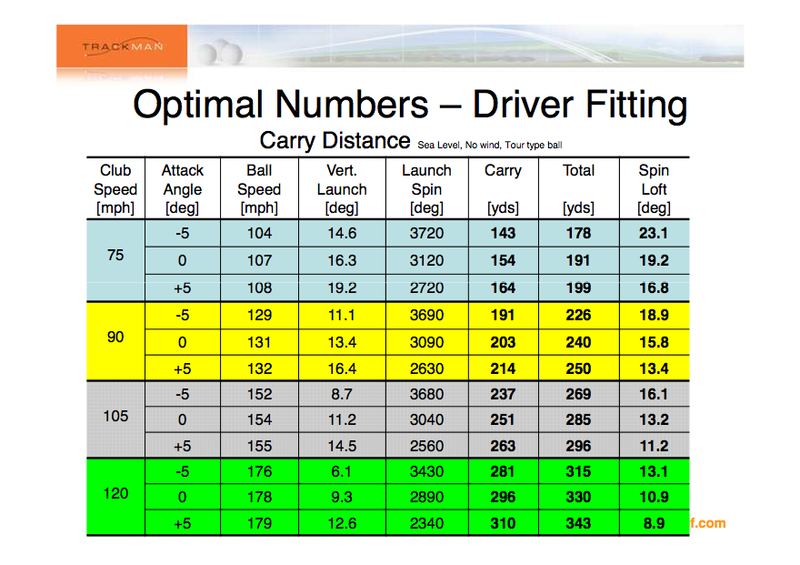 The chart below provides and indication as to what to expect in terms of distance based on club-head speed. Is there such a thing as a ‘standard’ set of golf clubs in terms of length and loft? In the days of drivers with steel shafts and persimmon heads, the standard length for a driver was 43 inches. With the introduction of graphite shafts and titanium heads the new standard for drivers is 45+ inches. In terms of irons, in the 1970’s most golf manufacturers adhered to what was known at the 24/38 rule when it came to iron loft and length. That rule says that the average male golfer could be expected to hit a golf club with 24 degrees of loft and an overall length of 38 inches approximately 170 yards. Irons with a lower loft or a longer shaft was reserved for the very accomplished or elite players. In the 1970’s on average a 3 iron had 24 degrees of loft and was 38 inches long. Fast forward to today and despite the improvements in club heads, shafts and grips the 24/38 rule still applies. The average male golfer still hits a club with 24 degrees of loft and an overall length of 38 inches, 170 yards. What has changed is that the number assigned to the club has changed from a ‘3’ to a ‘5’. In terms of specifications, today it’s the 5 iron and not the 3 iron that has around 24 degrees of loft and an overall length of 38 inches. What caused this loft and length creep? In a word, marketing. The large golf club manufacturers found themselves in a very competitive situation and in an attempt to set themselves apart, manufacturers would produce clubs with claims of greater distance. Remember those ads that claim ‘our clubs are one club longer”, or “two clubs longer” than the competition? Well, they were not really one club longer. When you take a 7 iron and substantially decrease the loft and extend the shaft by up to an inch you have effectively turned it into a 6 iron and yes, 6 irons will go further than 7 irons. Between 1970 and the present most if not all club manufactures have strengthen the lofts, and extended the shafts on off the counter iron sets, effectively creating a new ‘standard’ in terms of iron loft and length. The table below shows how the loft and length of clubs has changed from 1970 to the present. The data in this table represents industry averages. 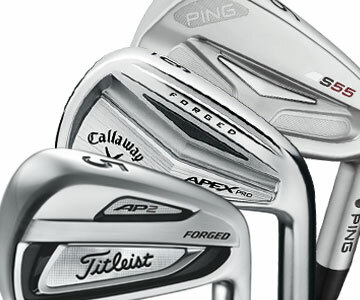 There are some variations that fall outside the averages; for example the new Titleist AP1 irons start with a 19 degree 3 iron, as do the new Taylormade PSi irons, with more aggressive lofts throughout the set. The next time you hear a commercial about irons that go further, check the lofts and lengths before you buy them. It might be much more economical to simply take a sharpie and write a different number on the bottom of your iron and perhaps lengthen the shaft by a half an inch, than buying into the hype and spending money on a new set. In a previous post I talked about how high handicap golfers tend to score better (relative to par) on par 3 holes as compared to par 4’s and par 5’s, and how the opposite is true for scratch and low handicap golfers who score better (relative to par) on par 4’s and par 5’s. 1) The shorter the par 3 the easier it is to score well. 2) Most high handicap golfers tend to play off the forward tees which means that for them most par 3’s are in the range of 150 yards or less. Many scratch or low handicap players will play off the longer tees with an average distance closer to the 190 yard range. So on par 3 holes high handicappers have significantly shorter tee shots to contend with than golfers playing of the back tees. 3) In many sports there is no substitute for speed. In golf there is no substitute for distance. Generally speaking, low handicap golfers hit the ball further than high handicap players and in many cases are also more accurate. Low handicap players, even though they may play off the longer tees, tend to have shorter approach shots into the green than high handicap players on par 4’s and especially par 5’s. This disparity in distance off the tee means that for many high handicap golfers their approach shots on par 4’s and par 5’s are longer than their normal tee shot on par 3’s, whereas for low handicap players their approach shots on par 4’s and par 5’s are shorter than their typical tee shot on par 3’s. 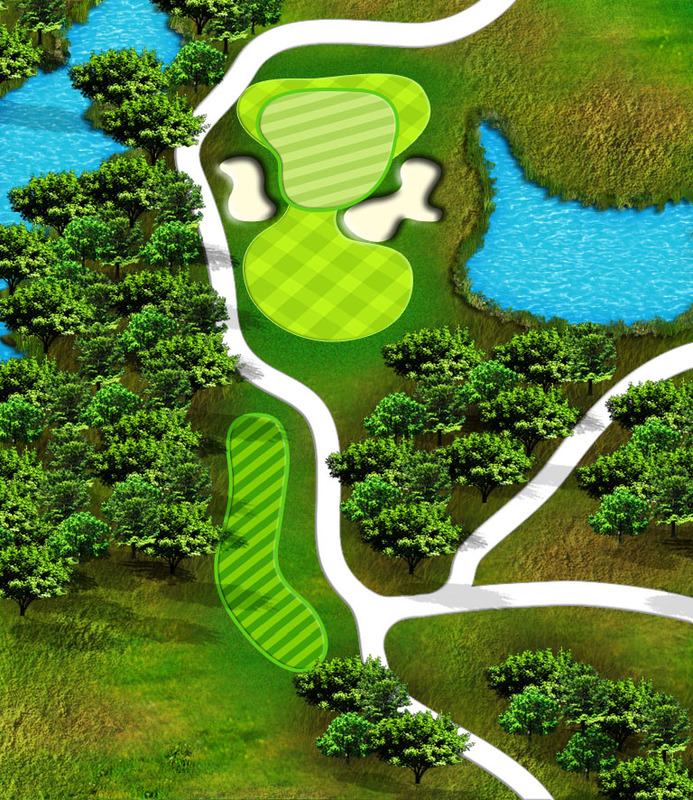 In some cases par 5’s become two shot holes for the scratch player which further promotes lower scores. The long and the short of it (pun intended) is that low handicap golfers because of their additional length and accuracy have the ability to turn their approach shots on par 4’s and par 5’s into short par 3’s. The shorter the “par 3” the lower the score. The Manitoba Mens Amateur will be contested at the Minnewasta Golf and Country Club in Morden Manitoba from July 18-21, 2016. Off the back tees, Minnewasta plays to a par of 72 , with a course rating of 72.3 and a slope of 130. The qualifying venues for neither event have been announced yet.